Yesterday was the day I have been waiting for all summer long. The Little Miss has returned to school and I can blissfully set my attention to all the tasks that have been piling up on me this summer. Number one on the list? The "Yarn Room" (as the hubs likes to call it). I'm lucky enough to have a room to call my own -- where I stash my yarns, my crafting goods, my sewing machine, and many of my favorite things. But my room is getting rather full. You see, even though the dolls don't appear in my Etsy shop that often anymore, I haven't stopped making them. At the moment, there are 4 boxes of finished amigurumi, along with many more crowding my shelves and, well... just about any other flat surface in the yarn room. It's time to find them some homes. 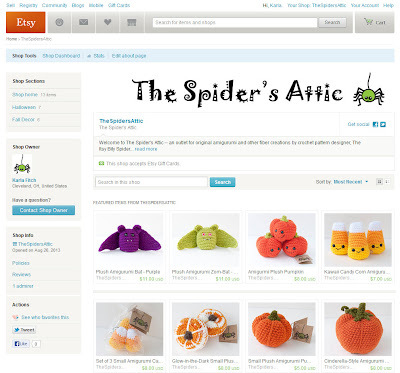 I didn't want to confuse The Itsy Bitsy Spider with plush listings, so I figured it was time to open a second Etsy shop. Introducing... The Spider's Attic! I just finished loading all of the fall and Halloween inventory from the depths of the yarn room, and as soon as it stops raining here I'll start photographing and adding some of the other goodies I have stashed. And, as a special introduction to my new shop, I've taken at least $1 off every listing. Now, for those of you who know and love my patterns, never fear... I will continue to sell those through all your favorite outlets -- and if you don't have time to whip up a creation of your own, I hope you'll check out The Spider's Attic and give some poor, deserving amigurumi creation a chance at a better home! Thank you to everyone who reached out to me after my RA post. I'm still dealing with a lot of pain in my left index finger, but taking a break from crochet to work on The Spider's Attic is giving my joins time to heal. I sincerely appreciate your prayers, kind words, and encouragement. They have meant more to me than I can tell.